The August Canadian Living cover recipe is a Blueberry Cornmeal Cobbler. I've never made or even eaten a cobbler before. I usually don't eat desserts where the main ingredient is berries. I prefer cakes and cookies. Recently my sister-in-law made a berry crisp which I really enjoyed so I was looking forward to trying out this cobbler recipe. 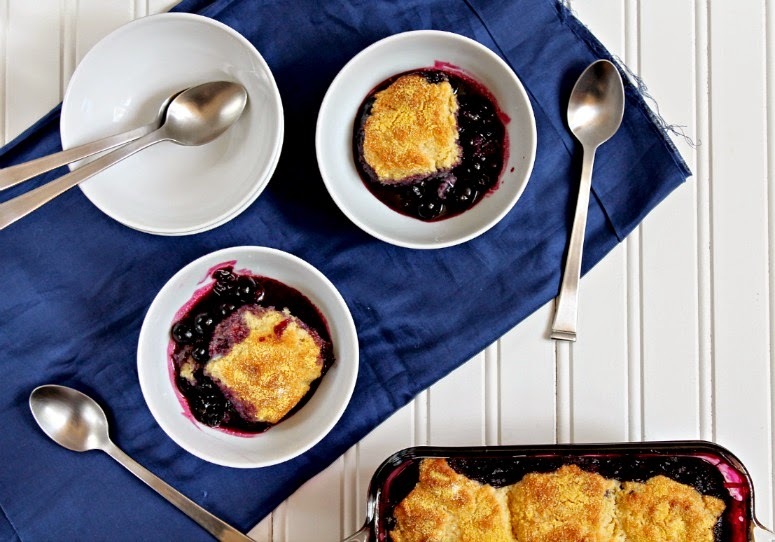 Canadian Living's Blueberry Cornmeal Cobbler is a very quick dessert to put together. It requires a lot of blueberries so I knew our resident berry lover (Bilal) would go crazy for this dessert. The blueberries are tossed with some sugar, cornstarch and almond extract. The biscuit topping also comes together quickly and has some ground ginger in it. All these flavours worked very well together in the cobbler. When baking, make sure to put your dish on top of a baking sheet. I didn't do this and the blueberry sauce spilled over onto the oven floor. We enjoyed this cobber warmed and topped with some vanilla ice cream. My mom was over when I made this cobbler and she also really liked it. Bilal just wanted to eat the blueberry sauce. Hasan wasn't on board but I was expecting that because there are certain textures he doesn't like. This is a dessert I would definitely make again! To see how the other Canadian Living Network bloggers dessert turned out click here. Pretty pictures as always, I am not big on fruit desserts either. It's a miracle I have gotten myself to eat raw fruit let alone cooked fruit! This looks great! I never really cared for fruit desserts before but as I'm growing older my tastes are evolving as well. I love making crisps and crumbles, but I've never tried a cobbler before. Your biscuit topping sounds wonderful! :) miss you tons!